Pan Fried Breast of Mallard with Honey, Soya Sauce and Glace Ginger. Take the mallard and with a sharp knife score the skin finely. In a bowl place the honey, soy sauce and finely chopped glace stem ginger. Mix this well and pour into a shallow dish. Lay the duck breasts into the soy marinade skin side down, then cover and leave in fridge overnight. The next day turn them over and so they marinate on the other side for an hour or two. To make the sweet chilli sauce: Cut the chillies in half and remove the seeds, slice into very thin strips and then chop finely. Add some oil to the pan. When the oil is hot, quickly stir fry the chillies until the oil turns a reddish colour, then add white wine vinegar, bring to the boil and add the honey. Take the noodles, place them in a bowl and pour over enough boiling water to cover and leave for 5 to 8 minutes to soften then drain. 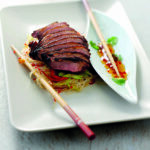 Once the duck has marinated, pat dry and place in a cold non-stick frying pan fat side down. As the pan gets hot the fat will render down and the skin will crisp up. When it browns, turn the duck over and seal on the other side. Cook for 4 minutes on the other side, then remove form the pan and allow to rest for 4 minutes. In the same pan fry off the red pepper for 5 minutes then add the spring onion and cook for a further 2 minutes. Add 50 ml of sweet chilli sauce and the noodles and saute well. 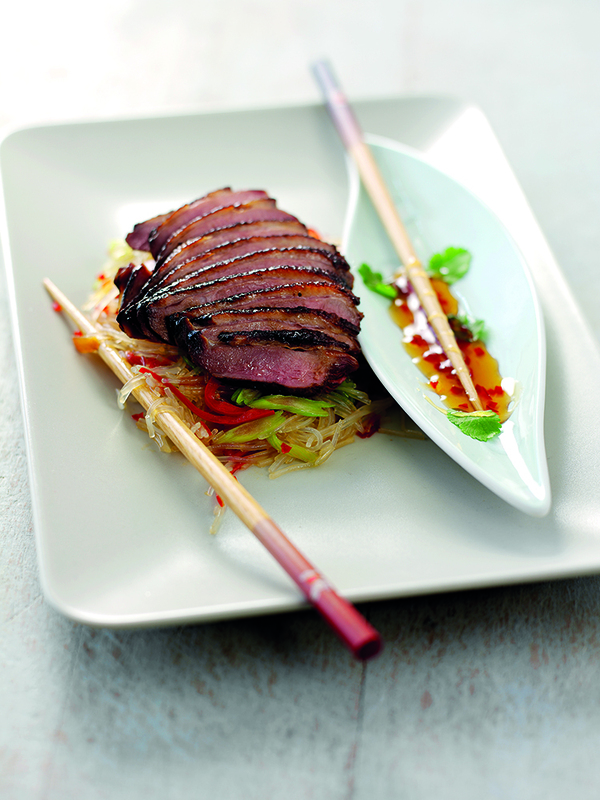 Place a portion of noodles on the plate, thinly slice the duck then lay it on the noodles and enjoy.